One method of facilitating developers to understand the complex inner nature of software that we have employed is the use of information visualization. Software is often so complex that even the developers who initially created it cannot understand all of the possible runtime behaviors that it can exhibit — specifically, all of the bugs that it may contain. In order to present large code bases with innumerable characteristics and relationships of its components (e.g., instructions, variables, values, and timings) we have developed a number of novel visualizations of software. Spider SENSE: Software-Engineering, Networked, System Evaluation. Nishaanth H. Reddy, Junghun Kim, Vijay Krishna Palepu, James A. Jones. Proceedings of the IEEE Working Conference on Software Visualization, Tool Track (VISSOFT-Tool), Bremen, Germany, September 2015, pp. 1–5. Today, many of the research innovations in software visualization and comprehension are evaluated on small-scale programs in a way that avoids actual human evaluation, despite the fact that these techniques are designed to help programmers develop and understand large and complex software. The investments required to perform such human studies often outweigh the need to publish. 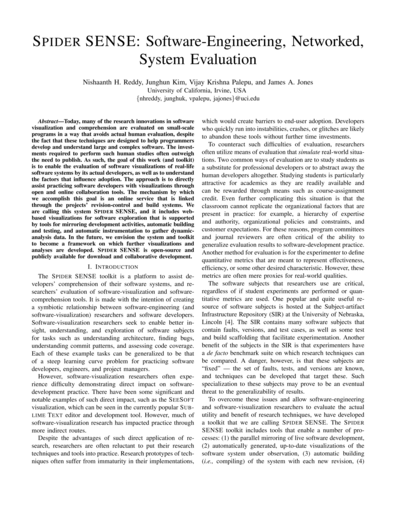 As such, the goal of this work (and toolkit) is to enable the evaluation of software visualizations of real-life software systems by its actual developers, as well as to understand the factors that influence adoption. The approach is to directly assist practicing software developers with visualizations through open and online collaboration tools. The mechanism by which we accomplish this goal is an online service that is linked through the projects' revision-control and build systems. We are calling this system Spider SENSE, and it includes web-based visualizations for software exploration that is supported by tools for mirroring development activities, automatic building and testing, and automatic instrumentation to gather dynamic-analysis data. In the future, we envision the system and toolkit to become a framework on which further visualizations and analyses are developed. Spider SENSE is open-source and publicly available for download and collaborative development. James A. Jones. Dissertation. Georgia Institute of Technology, Atlanta, Georgia, USA, 2008, pp. 1–192. Gammatella: Visualizing Program-Execution Data for Deployed Software. James A. Jones, Alessandro Orso, Mary Jean Harrold. Palgrave Macmillan Information Visualization Journal, Volume 3, Number 3, September 2004, pp. 173–188. Software systems are often released with missing functionality, errors, or incompatibilities that may result in failures in the field, inferior performances, or, more generally, user dissatisfaction. 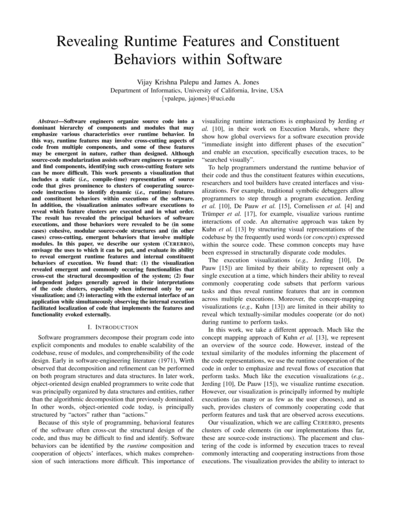 In previous work, some of the authors presented the GAMMA approach, whose goal is to improve software quality by augmenting software-engineering tasks with dynamic information collected from deployed software. The GAMMA approach enables analyses that (1) rely on actual field data instead of synthetic in-house data and (2) leverage the vast and heterogeneous resources of an entire user community instead of limited, and often homogeneous, in-house resources. When monitoring a large number of deployed instances of a software product, however, a significant amount of data is collected. Such raw data are useless in the absence of suitable data-mining and visualization techniques that support exploration and understanding of the data. In this paper, we present a new technique for collecting, storing, and visualizing program-execution data gathered from deployed instances of a software product. We also present a prototype toolset, GAMMATELLA, that implements the technique. Finally, we show how the visualization capabilities of GAMMATELLA facilitate effective investigation of several kinds of execution-related information in an interactive fashion, and discuss our initial experience with a semi-public display of GAMMATELLA. Gammatella: Visualization of Program-Execution Data for Deployed Software. Alessandro Orso, James A. Jones, Mary Jean Harrold, John Stasko. Proceedings of the 26th International Conference on Software Engineering (ICSE), Formal Tool Demonstration, Edinburgh, Scotland, United Kingdom, May 2004, pp. 699–700. Fault Localization Using Visualization of Test Information. 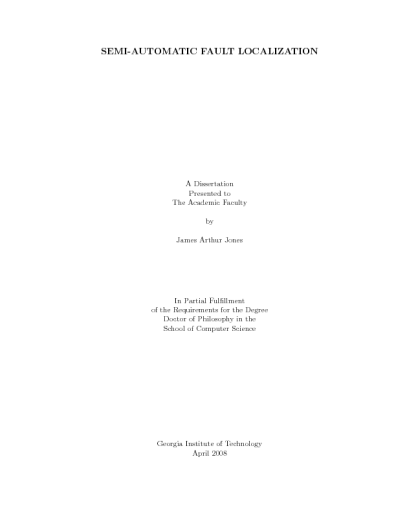 James A. Jones. 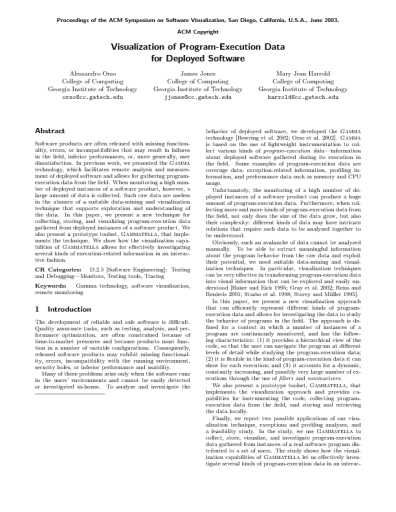 Proceedings of the Doctoral Symposium at the 26th International Conference on Software Engineering (ICSE), Edinburgh, Scotland, United Kingdom, May 2004, pp. 54–56. Visualization of Program-Execution Data for Deployed Software. Alessandro Orso, James A. Jones, Mary Jean Harrold. 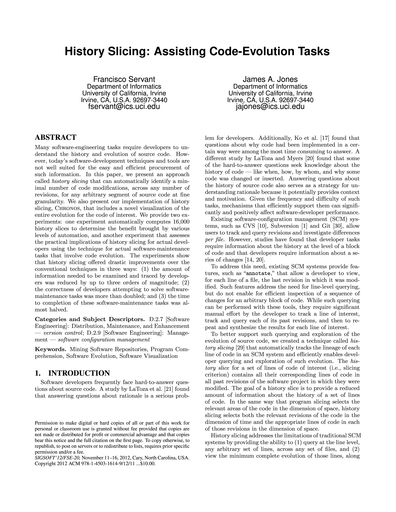 Proceedings of the ACM Symposium on Software Visualization (SoftVis), San Diego, California, USA, June 2003, pp. 67–76. Software products are often released with missing functionality, errors, or incompatibilities that may result in failures in the field, inferior performances, or, more generally, user dissatisfaction. In previous work, we presented the Gamma technology, which facilitates remote analysis and measurement of deployed software and allows for gathering program-execution data from the field. When monitoring a high number of deployed instances of a software product, however, a large amount of data is collected. Such raw data are useless in the absence of a suitable data-mining and visualization technique that supports exploration and understanding of the data. In this paper, we present a new technique for collecting, storing, and visualizing program-execution data gathered from deployed instances of a software product. We also present a prototype toolset, Gammatella, that implements the technique. We show how the visualization capabilities of Gammatella allows for effectively investigating several kinds of execution-related information in an interactive fashion. Visualization of Test Information to Assist Fault Localization. James A. Jones, Mary Jean Harrold, John Stasko. Proceedings of the 24th International Conference on Software Engineering (ICSE), Orlando, Florida, USA, May 2002, pp. 467–477. One of the most expensive and time-consuming components of the debugging process is locating the errors or faults. To locate faults, developers must identify statements involved in failures and select suspicious statements that might contain faults. 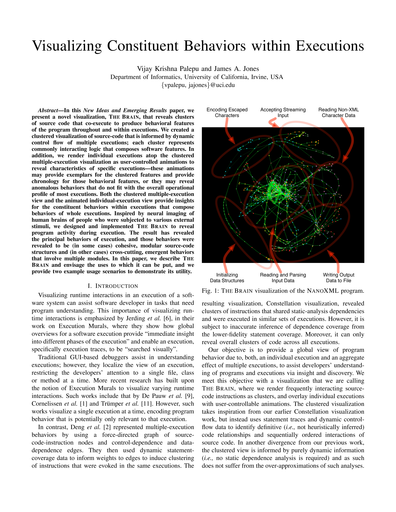 This paper presents a new technique that uses visualization to assist with these tasks. The technique uses color to visually map the participation of each program statement in the outcome of the execution of the program with a test suite, consisting of both passed and failed test cases. Based on this visual mapping, a user can inspect the statements in the program, identify statements involved in failures, and locate potentially faulty statements. 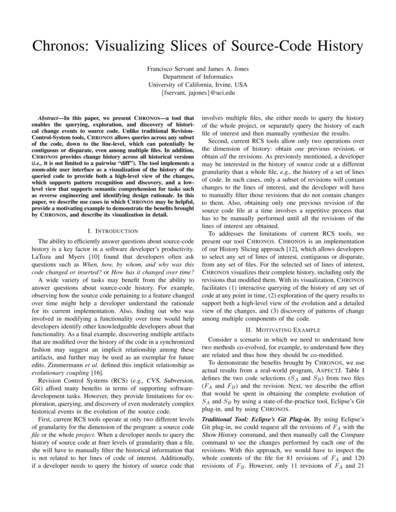 The paper also describes a prototype tool that implements our technique along with a set of empirical studies that use the tool for evaluation of the technique. 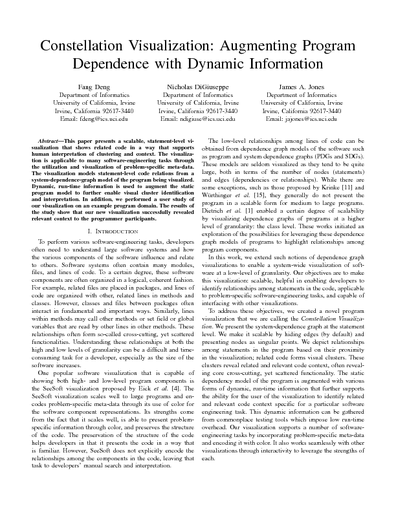 The empirical studies show that, for the subject we studied, the technique can be effective in helping a user locate faults in a program. 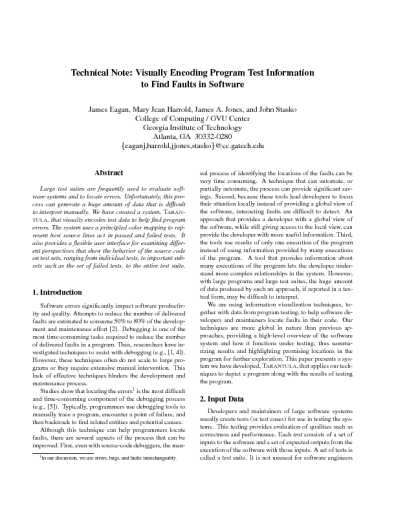 Technical Note: Visually Encoding Program Test Information to Find Faults in Software. James Eagan, Mary Jean Harrold, James A. Jones, John Stasko. Proceedings of IEEE Information Visualization (InfoVis), San Diego, California, USA, October 2001, pp. 33–36. Large test suites are frequently used to evaluate software systems and to locate errors. Unfortunately, this process can generate a huge amount of data that is difficult to interpret manually. We have created a system, Tarantula, that visually encodes test data to help find program errors. The system uses a principled color mapping to represent source lines in passed and failed tests. It also provides a flexible user interface for examining different perspectives that show the behavior of the source code on test sets, ranging from individual tests, to important subsets such as the set of failed tests, to the entire test suite. James A. Jones, Mary Jean Harrold, John T. Stasko. Proceedings of the Workshop on Software Visualization (SoftVis), 23rd International Conference on Software Engineering, Toronto, Ontario, Canada, May 2001, pp. 71–75.